During the holy month of Ramadan, take the time to relax, reflect and renew. Take advantage of the wide range of after sunset Iftars that are on offer from the region’s leading hotels and restaurants to break your fast in style, or simply to enjoy the delicious cuisine on offer and experience something new. With so many to choose from, we’ve put together our top 5. For the epitome of stylish of Iftars head to Dubai’s most fashionable hotel, Palazzo Versace which overlooks the Dubai Creek, to really savour a variety of Iftar and Suhoor delicacies. Held at the striking Giardino restaurant, experience magical nights including live cooking and carving stations offering a wide variety of authentic culinary creations from Syria, Morocco, Turkey and the UAE itself. Feast on delicious mezzes before you have run of a delicious selection of kebabs, rotisserie and grilled meats. The lamb Ouzi is mouth-watering and make sure you wash it down with one of the fresh juice blends. Suhoor will also be held here from 10pm where you can enjoy live entertainment and shisha. For enquiries and reservations, please email giardino@palazzoversace.aeor call +971 4 5568840. Any Ramadan celebrations of the renowned Jumeirah Group were always going to be good and this year Jumeirah Beach Hotel launched their beautiful offerings with a star-studded media bang. Reflect and indulge in quality time with loved ones over Iftar at the Safinah Ballroom located just at the front of the hotel. Decorated beautifully, an Iftar here is an event in itself and blends the prestigious Jumeirah hospitality with supreme culinary excellence. With an enormous buffet ( and we mean it’s huge! ) it includes a selection of teas, coffee and Ramadan juices. Enjoy the smoky live cooking stations outside and the wealth of salads, vegetables and international dishes inside, in fact there is so much choice, you’ll be back and forth all night! The mamemo majlis is back by popular demand this year at the luxury Ritz Carlton, Dubai. Boasting a prime position on JBR, the LouLou ballroom is transformed into a stunning venue for both Iftar and Suhoor. Featuring traditional Arabic design motifts with a contemporary twist, the lavish, pastel coloured space is, for the first time, showing the UEFA EURO 2016 games making it the perfect option for sport lovers. The Kempinski Hotel Mall of the Emirates is celebrating Ramadan with the launch of a luxurious, fully air-conditioned marquee on the terrace of the Levantine restaurant. 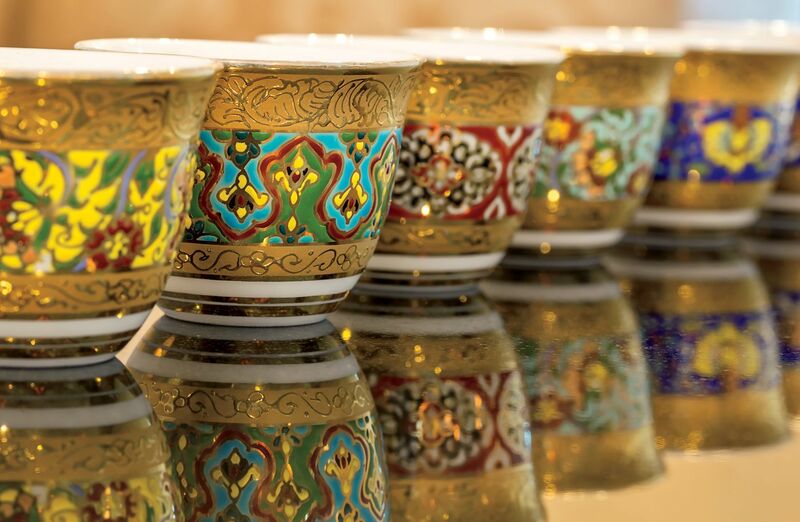 Featuring a lavish Iftar buffet and a la carte Suhour menu, the restaurant is celebrating its Levantine heritage and feature dishes from the six countries meaning guests can experience a true taste of home during the holy period. Signature dishes such as Mansaf Lahem, a national Jordanian dish featuring lamb cooked in dried yoghurt served with rice and flatbread is a must try. The Iftar Buffet at Olea, which runs from sunset until 9pm every evening throughout Ramadan and is priced at AED175 per person, with a 50% discount for children aged from six to 12 years old. The signature restaurant of this funky hotel offers something a little different this Ramadan with their take on a classic Iftar dinner. This tantalizing four-course meal includes the restaurant’s Indian classics presented with an Arabesque inspired and unique twist. Start off with two delectable Sherbets, Labneh and an assorted premium Date selection or the House Salad, then enjoy mouth-watering favourites such as Rumani Paneer, Masala Chaanch Rubiyan, Mutton Shami Kebab or Sumac Spiked Grilled Fish. Main dishes will offer something for everyone, including Kabuli Channa Gosht, Lalla Mussa Dal, Chicken Biryani and a Veggie Pot. Finish the culinary journey on a sweet note with Mahalabia, Phirnee and Chenna Angoori!